It’s been known that power, fame and money destroys a man but in this instance, a man shows us that you can use the trio against each other, power destroying money. 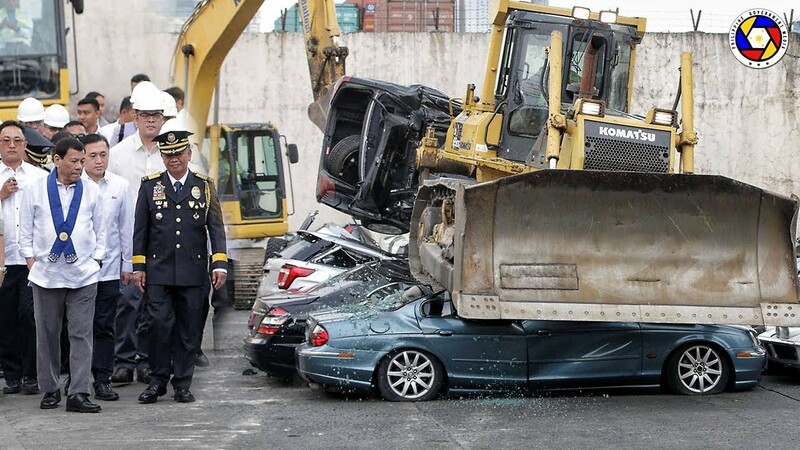 That is literally what the most powerful man in the Philippines, President Rodrigo Duterte did to an estimated total of P62 million worth of smuggled and imported high end luxury vehicles. BoC Commissioner Isidro Lapeña said that putting the cars in an auction was not an option, the agency would rather destroy the smuggled luxury vehicles. The President didn’t even flinch as each of the 20 vehicles were condemned at by road rollers the Bureau of Customs (BoC). Brands like Lexus, BMW, Mercedes Benz, Audi, Jaguar and a Corvette Stingray saw their demise for they were illegally smuggled for and quite possibly by wealthy car enthusiasts who avoid want to taxes and import fees. “You want imported cars? Pay import duties first,” said Duterte, hinting that the condemnation of the smuggled vehicles was a message to those illegal car smuggles and tax-evading wealthy car enthusiasts alike.